Honk for Grandma!! A real-life “Runaway Grandmother”? My wife Jennifer saw this picture on Reddit and of course immediately had to text it to me because of what happened in last week’s story of The Runaway Grandmother. The Runaway Grandmother is one of the most long running urban legends ever, and it deals with the crazy situation a family finds itself in when Grandma dies in the middle of their vacation. The family is stuck in the middle of nowhere and doesn’t know what to do with the body, so they wrap it in a tarp and put it on the roof. 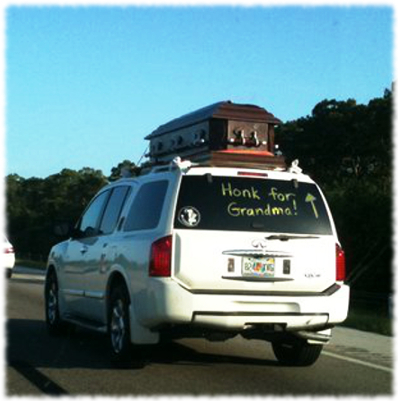 In this picture you can see a person in Florida who has a casket strapped to the roof of their car with the words “Honk for Grandma!” written on their back window. And there’s an arrow pointing to the casket in case you didn’t quite get the idea. What!? Haha. I almost *ahem* …died… laughing when I saw this picture. Could it be a real-life Runaway Grandmother type situation? Or maybe someone just went over the top in decorating their car for Halloween? And were they inspired to do this after reading The Runaway Grandmother urban legend? Come on Person In The White SUV, tell us your story! In the meantime I’ll definitely honk for Grandma…and crazy urban legends.